Europe has been a rich source of many influential educational ideas. In elementary and early childhood education, two of the best-known approaches with European origins are Montessori, and Reggio Emilia. Both are seen as strong educational alternatives to traditional education and as sources of inspiration for progressive educational reform. These two approaches to early childhood education were born in Italy: the first one conceived by Maria Montessori (1870-1952), a brilliant figure who was Italy's first woman physician, and the second one by Loris Malaguzzi (1920-1994) a primary school visionary teacher who in 1950 qualified as an educational psychologist and founded Reggio Emilia’s municipal Psycho-Pedagogical Medical Centre. Dr. Montessori first developed her educational approach while working with a preschool population, in particular, children with disabilities. She gradually extended her approach to children and youth of all ages and abilities. Today, some Montessori schools provide all levels of learning, from infant & toddler through the secondary (high school) level. The Reggio approach however, is a birth to age 6 early childhood program. The programs have several key areas of similarity and contrast. Both are child-centered approaches in which children are viewed as active participants in their own development, strongly influenced by natural, dynamic, self-correcting forces within themselves, opening the way toward growth and learning. The teachers of both approaches are considered nurturers, partners, and guides to the children. The teachers depend on carefully prepared, aesthetically pleasing environments as a pedagogical tool. Partnering with parents is also highly valued in both approaches. However, there are also areas of difference, some at the level of principle and others at the level of strategy. Reggio Emilia is not a formal model like Montessori, with defined methods, teacher certification standards, and accreditation processes. Instead, educators in Reggio Emilia speak of their evolving "experience" and see themselves as a “provocation” and reference point, a way of engaging in dialogue starting from a strong and rich vision of the child. 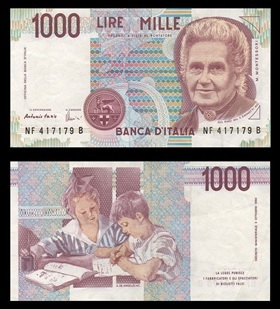 Italian 1000 Lire banknote (approx. 0.52 €) representing Maria Montessori. Dr. Montessori started her Casa dei Bambini (Children's House) in 1907, in the slums of Rome for children ages 4 through 7. Her movement later on spread to other countries, especially after the Fascist regime denounced Montessori methods of education and she left Italy. In the United States, there was strong but brief interest from 1910 to 1920. Although the method flourished in Europe and India, it fell out of favor in the United States. The Montessori education movement experienced a resurgence in the US during the 1950s increasing its popularity. Launched in 2013 the USA Montessori Census is a collaboration among the National Center for Montessori in the Public Sector (NCMPS), the Center for Research on Developmental Education, and some other Montessori organizations. Currently, the Census maintains information on 514 public programs and 2,075 private schools in the U.S.
Montessori emphasizes independent learning, letting children grow into lifelong learners and responsible citizens of the world. In Montessori education, children usually are grouped into multiage classrooms spanning three years, promoting adult-child continuity and close peer relationships. Montessori classrooms provide carefully prepared, orderly, pleasing environments and materials where children are free to respond to their natural tendency to work individually or in small groups. The children progress at their own pace and rhythm, according to their individual capabilities. The school community as a whole, including the parents, work together to open the children to the integration of body, mind, emotions, and spirit that is the basis of holistic peace education. The Montessori teacher plays the role of unobtrusive director in the classroom as children individually or in small groups engage in self-directed activity. The teacher's goal is to help and encourage the children, allowing them to develop confidence and inner discipline so that there is less and less need to intervene as the child develops. Montessori developed a set of manipulative objects designed to support children’s learning of sensory concepts such as dimension, color, shape and texture, and academic concepts of mathematics, literacy, science, geography and history. They are given the freedom to choose what they work on, where they work, with whom they work, and for how long they work on any particular activity, all within the limits of the class rules. No competition is set up between children, and there is no system of extrinsic rewards or punishments. These two aspects—the learning materials themselves, and the nature of the learning—make Montessori classrooms look strikingly different to conventional classrooms (Marshall, 2017). 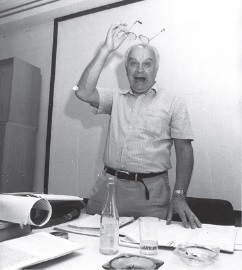 In post-World War II Italy, teacher and educational psychologist Loris Malaguzzi teamed with a group of local parents and children to build an innovative network of municipal infant-toddler centers (ages 0 to 3) and preschools (ages 3 to 6) in and around the city of Reggio Emilia, in Northern Italy. The system evolved from a parent cooperative movement into a city-run system that exercises a leadership role in Italy, throughout Europe, and now increasingly in Asia, Australia, North America, and other parts of the world. The approach is based on a vision of a child being an individual with rights and potential. At the center of the Reggio Emilia approach is Malaguzzi’s belief that “the child has a hundred languages” meaning young children have a hundred different ways of thinking, learning and expressing themselves. Each one of these “languages” should be celebrated, nurtured and developed. Programs in Reggio are family centered and serve children at infant-toddler and preschool levels, with first priority given to children with disabilities or social service needs. His vision of an "education based on relationships" focuses on each child in relation to others supporting children's reciprocal relationships with other children, family, teachers, society, and the environment. Teachers follow the children's interests and do not provide direct instruction in reading and writing. Literacy is promoted through communication. Long-term, open-ended projects are created promoting collaboration Teachers organize the classroom environment with materials that “provoke” and “invite” children to explore and problem solve, often in small groups. Teachers collect data and record observations of child preferences to create environments that promote individualized learning activities. According to the supporters of both Montessori and Reggio Approach the benefits to children are many and varied. The most valuable advantage of these early learning approaches is that they ignite a love of learning. The supporters claim that benefits include resilience, responsibility, self-confidence, teamwork, problem-solving skills as well as creative and scientific thinking. As they are both based on constructivist teaching, they place more emphasis on sensory input. Children are actively involved in the learning process, using all of their senses, not just their eyes and ears. Active learning approaches emphasize the role of the teacher as a guide. All of these ideas combined, form a modern version of educational constructivism, which states that learning best happens when children get to construct and form their own knowledge. Instead of being told how to think or what to memorize, children are encouraged to create their own understanding of the world. Other contemporaries of Montessori and Malaguzzi shared similar ideas about constructivism. The American educator, John Dewey, first began to posit ideas that would form a basis for constructivism. He believed that school should promote problem solving through active participation rather than rote memorization and note-taking notes. Jean Piaget, the Swiss psychologist also believed that learning doesn’t merely happen from someone talking at a child, but rather, the learning process is an active and dynamic one. Lev Vygotsky, from Russia, thought that children’s experiences happen in a socially constructed way, and then again, on an individual level. Bruner, a pioneer of cognitive psychology in the United States, thought that different processes were used by learners in problem solving, that these vary from person to person and that social interaction lay at the root of good learning. He builds on the Socratic tradition of learning through dialogue, encouraging the learner to come to enlighten themselves through reflection. The 2017 review of the benefits of the Montessori education system indicates that there is evidence in support of certain elements of the Montessori method (e.g. teaching early literacy through a phonic approach embedded in a rich language context, and providing a sensorial foundation for mathematics education). This review also indicates that while some evidence exist that children may benefit cognitively and socially from Montessori education that implements the original principles, it is less clear whether modern adapted forms of Montessori education are as effective. The Evaluation of the Reggio Approach to Early Education (Biroli, et al, 2017) indicates that the Reggio Approach is positively associated with outcomes related to employment, socio-emotional skills, high school graduation, election participation, and obesity. But they state that their research about the effectiveness of the Reggio Approach is provisional and needs more detailed study. During the mid-20th century there was a surge of interest in how children learn, especially after WWII. Montessori and Malaguzzi, like their American, Swiss, and Russian contemporaries emphasized active learning, problem-solving, and self-discovery as critical components of early childhood development. Biroli, P., Del Boca, D., Heckman, J.J., Heckman, L., Koh, K.Y., Kuperman, S., Moktan, S., Pronzato, C. & Ziff,A. (2017). Working Paper Evaluation of the Reggio Approach to Early Education. IZA Discussion Papers, No. 10742, Institute of Labor Economics (IZA), Bonn. Available from: https://www.econstor.eu/handle/10419/161365. Edwards, C.P. (2002). Three approaches from Europe: Waldorf, Montessori, and Reggio Emilia. Early Childhood Research and Practice 4:1–13. Available fromhttp://ecrp.uiuc.edu/v4n1/edwards.html. Honebein, P.C. (1996). Seven goals for the design of constructivist learning environments. Available from: https://scinapse.io/papers/100238786. Marshall, C. (2017). Montessori education: a review of the evidence base. npj Science of Learning(2), id. 11. Montessori, Maria (1912) 1964. The Montessori Method.